You will be happy to know that we now have 230 women enrolled in our Microfinance Program, a majority of whom are running successful businesses. The businesses chosen by the women are quite diverse and range from groceries (cooking oil, rice, sugar, eggs, fruits, vegetables, beans, and mealie meal, a Zambian staple), restaurants, and salons to selling dressed chicken, dried fish, charcoal, baby blankets, books, etc. Most women (about 50%) have started tiny grocery stores located close to their homes. About 20% of the women sell used clothes and shoes. These ladies travel by bus to the City Market in Lusaka, purchase the used clothing and shoes, and then resell these at a higher price in their community. Many of the businesses, such as charcoal, rice, beans, and sugar, involve the women buying in bulk, repackaging the item in smaller quantities, and reselling. These businesses benefit the community at large as well as the women running them - they are located within walking distance and community members are able to purhcase smaller and more affordable quantities. Here are the stories of two women who have inspired us with their inventiveness and “can do” attitude. Nelly is a 45 year old widow. Her husband died two years ago, leaving her her with six children and one grandson in her care. Her income as a maid was not enough to support herself and her family. 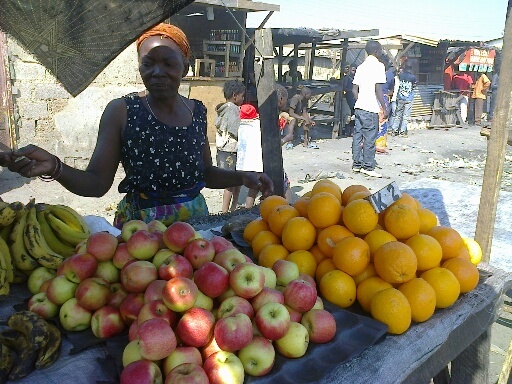 In September 2013, she received business training and a loan that enabled her to start a small restaurant at the Tuesday community market. At present, her restaurant draws a regular clientele and she has been able to move out of her sister’s place, where she had been living since the passing of her husband. She now rents a two-room apartment where she lives with her children and grandchild. Nelly is appreciative of our business training/loans program and the continued business guidance she receives to ensure her business is doing well. Emelesi is an old woman taking care of 12 grandchildren and 4 children of her own. She was having a difficult time caring for her children and grandchildren, especially given that two of her sons and three grandchildren are HIV positive. Prior to September 2013, she was washing clothes to earn money, but her income was not enough to provide food for everyone in her family. With the help of business training and a loan, Emelesi started a business selling used clothing. Since she started her business, she has stopped washing clothes for others and is focusing on her business. Emelesi says that she is happy that her family is now able to have at least two meals a day. She would like to thank supporters of our loans program as this program has made a huge difference in her life. Power of Love’s (POL) micro loans program empowers women impacted by HIV and AIDS by providing them with business training, a small loan, and business advice/monitoring over the course of the loan period. Our loans program has enabled impoverished women to engage in self-employment projects so they can meet basic needs and protect themselves and their families against unexpected financial expenses. Most enrolled women experience a dramatic improvement in their standard of living, and some even graduate out of poverty. For all involved there is perceived improvement in gender equality, improved economic welfare, and a sense of well-being and self-empowerment. We are proud to report that all of the outcomes of this project continue to be significant, sustainable, and permanent. Thanks again for your gift of empowerment, which has gone a long way in helping these women (about two-thirds of whom are single) take the first steps towards self-reliance.